An astonishing engagement during the Confederate wars in Ireland, saw an unlikely achievement by Irish rebels, when they sunk the flagship of Cromwellian forces at Duncannon. The loss of the Great Lewis must have been a significant boost to the confederate forces at the time, ultimately leading to the capture of the fort. The discovery of a wreck site in recent years is a major archeological find. This months guest blog by my cousin James Doherty looks at the back story leading up to the event. In the 16th and 17th century Waterford was a thriving port with a flourishing international trade. However, visiting foreign ships presented a potential security risk to the English administration. From trading, the Spanish and French knew ports like Waterford well and there was a danger that Ireland would be used as a stepping stone by an invading army whose final goal was England. In response to this perceived threat steps were taken to counter any invasion risk. Periodically the defences of Ireland were bolstered, locally in the 16th century a stone blockhouse was erected outside Reginald’s Tower in the city which mounted eight large brass canon (these were later stolen by a English pirate but that’s another story). A canon battery was erected at Passage East and Duncannon became the focus of the harbour defences. By December 1587 the fortification of Duncannon was nearly complete with two sconces (a type of angular earthwork) in place that could mount four culverin canon with a further four canon erected higher up in the fort. As the 16th century drew to a close the threat to the English empire lay from Spain and in 1588 its armada set sail. A combination of naval defeat and inclement weather ensured that only a third of the 130 ships of the Spanish Armada would ever return to home. The threat from Spain didn’t diminish however and her troops would land at Kinsale in support of Irish rebels in 1601. With Spanish troops fighting in Kinsale there was a risk of additional landings so defensive works on the coast took on a more frantic pace. A new fortification was completed at “The Fort of the Rock” situated across the river from Waterford on high ground with additional earthworks being added at Waterford City, Duncannon and Passage East . 1603 would see the defeat of the Irish rebels and the threat from Spain would recede, Duncannon would never be tested by the Spanish but a constitutional crisis in England and rebellion in Ireland would soon bring war to Duncannon. Less than forty years after the last major war in Ireland rebellion broke out in 1641 with Irish forces attacking Duncannon fort on St Stephens’s day. Lawrence Esmonde commander of the fort was a fascinating character; his post was a reward for his service during the Nine Years War (which had ended in 1603) and was in his eighties when he would see action once more. As is often the case in civil wars this conflict would divide families whilst Esmonde senior held Duncannon his son Thomas was a noted commander with the Irish rebels. The besieging Irish lacked the equipment or engineering expertise to break the defences of Duncannon and had to be content with bottling up the defenders in the fort. 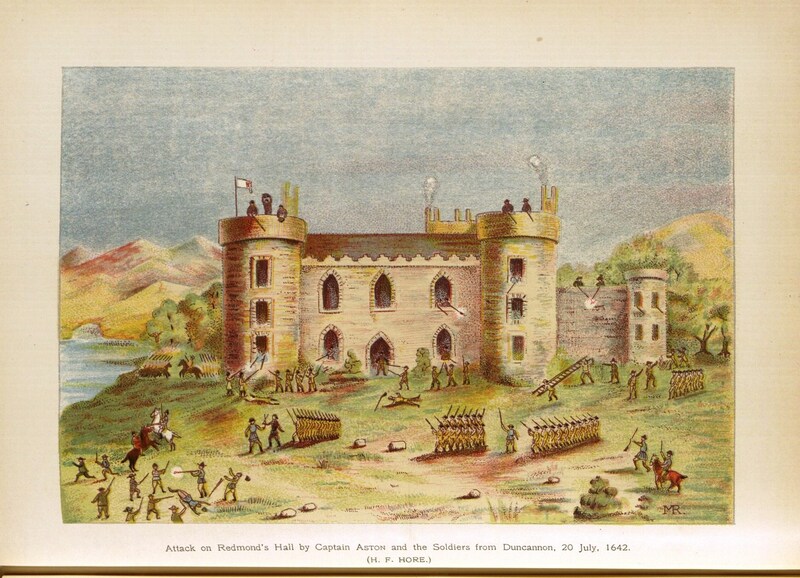 The English troops made occasional forays out of the fort and the fighting took on a bitter aspect with arbitrary hanging of prisoners occurring on both sides. The rebellion in Wexford as in other parts of Ireland took on a sectarian nature as protestant homes were raided for supplies with many fleeing towards the perceived safety of the fort. As the opposing forces settled in to what was effectively a siege, events in England would soon add an extra dimension to the Irish conflict. The origins of the English Civil War are complex, England in the 1640’s was in turmoil, a rift had formed between monarchy and parliament, and in addition to this power struggle Scotland and Ireland were in open rebellion. King Charles Ist dissolved his uncooperative parliament after they refused to help the king raise armies to fight the rebels. These divisions would eventually lead to civil war which started in 1642, English troops abroad would have to decide which side they supported. In Duncannon the garrison commander declared for the king although many troops’ sympathies lay with parliament. 1642 would see sporadic fighting around the vicinity of Duncannon; one notable incident saw 100 English troops leave the fort by boat and attack nearby Redmond Hall. The leader of this sortie is listed as a Captain Thomas Aston who owned lands in Crooke just across the river from Redmond Hall. The hall was seen as sympathetic to the rebel forces and when the troops approached the hall the residents refused them entry. Musket fire and a small canon were used on the hall but disaster struck when a numerically far superior Irish force fell on the attackers from nearby woods with the English force being wiped out. As King Charles couldn’t muster enough men for a campaign against the Parliamentary army in England and fight Irish rebels he choose the lesser of two evils and signed a peace treaty with the Irish in 1643. This led to a cessation of hostilities in Ireland against royal troops and an uneasy truce was in place around Duncannon. Throughout 1644 unhappy with any truce many of the king’s key army commanders switched sides and declared for parliament. Lawrence Esmonde was a king’s man and the circumstances around the Duncannon garrison going over to the side of parliament are unclear. One account from inside the fort mentions a parliament ship calling on the fort and the second in command a Lieutenant Larkin negotiating the garrison switching allegiance. It would appear that only a handful of the command staff stayed loyal to the king and Esmonde may have been left with no choice but to agree to the wishes of his men after his second in commands duplicity. With the garrison now declared for parliament hostilities would soon resume. 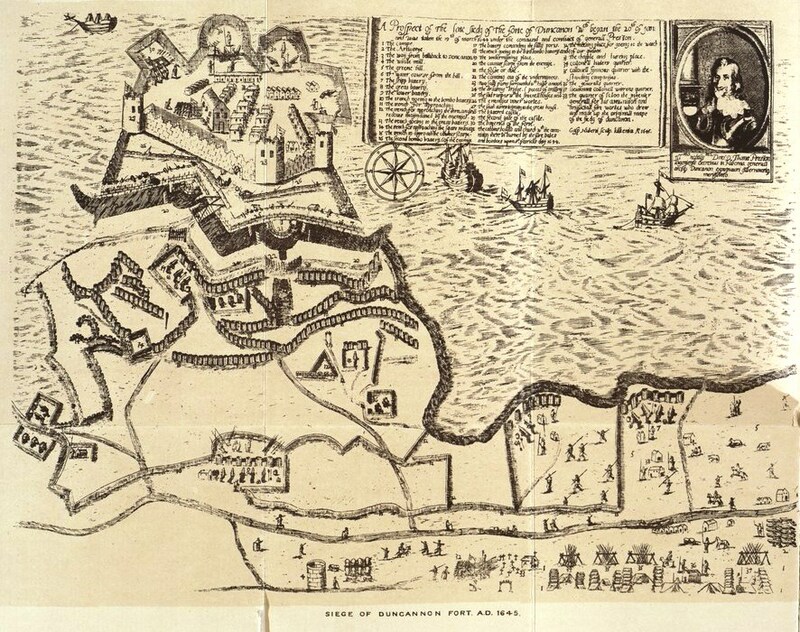 The Irish wanted to guarantee access to the Suir estuary and an army was dispatched from Kilkenny to deal with the fort. The stage was set for one of the most dramatic events in the forts military history. In command of the Irish army was General Thomas Preston who had seen service in Europe and brought the knowledge and equipment needed to break the siege of Duncannon Fort. Oliver Cromwell was aware of the precarious situation of the Duncannon garrison and dispatched 4 ships to resupply the fort with additional troops and supplies. When Preston’s Irish army arrived at Duncannon on the 20th of January he was met with the sight of a small fleet anchored off the fort. The Irish realising the vulnerable position of the four ships in the estuary spent the night of the 22nd of January moving their artillery to the high ground behind Duncannon. As dawn broke on the 23rd the ships realised they were trapped. The Irish had a window of several hours until the tide turned and they unleashed a sustained fire on the enemy vessels. When the tide and wind allowed Captain Bell ordered anchor cables cut and made way from the estuary as the four ships limped out of range of the Irish artillery. Bell’s own flagship the Great Lewis was the most severely damaged and would sink with the loss of 200 men on the 26th of January with the other three ships escaping the Irish coast once repairs had been made. The sinking of the Great Lewis was the turning point in the siege and a huge moral boost for the Irish, however the beleaguered garrison would hold out until the 18th of March before surrendering. The soldiers were allowed to march out to join the parliamentary army at Youghal with the fort now in Irish hands. In 1649 the fort would fall under siege again with the Irish being on the inside this time as the Cromwellian army gained territory in Ireland. This attack was unsuccessful but the fort would eventually surrender to Cromwell’s forces after a lengthy blockade in 1650. The eventual capitulation of Duncannon fort would bring an end to nearly a decade of conflict on the Hook peninsula. Thanks to James for todays piece. Next months guest blog will bring us to a more modern era at Dunmore from another regular, David Carroll. If you would like to contribute a piece to any of my guest blog Friday’s (last Friday of each month) please get in touch to russianside@gmail.com. 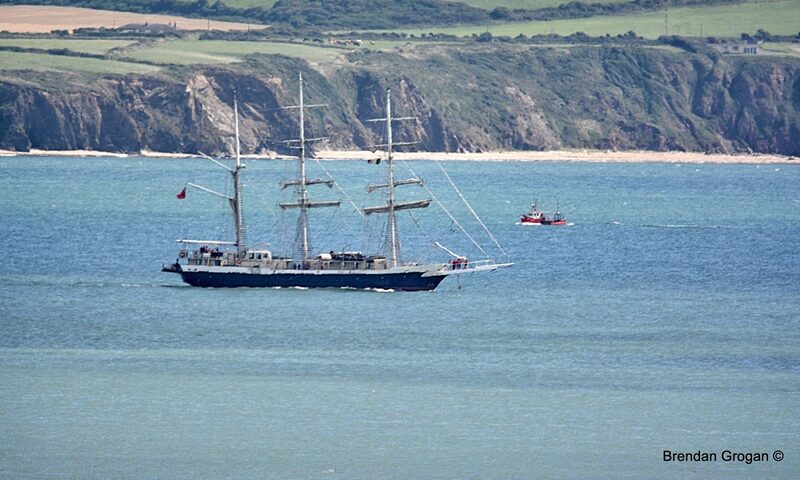 All I ask is that the subject matter be linked in some way to the maritime heritage of the area, and 1200 words approx. I will attempt to add photos and links to the piece and promote via my usual channels. 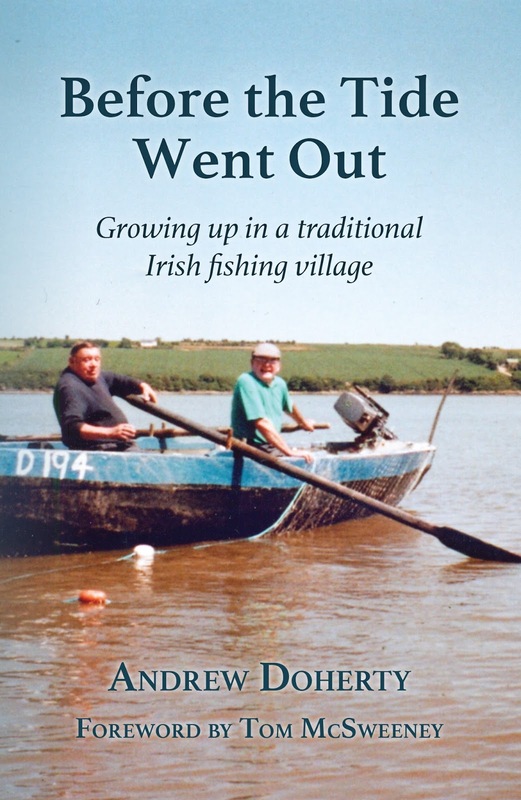 In my recent book on growing up in Cheekpoint I devoted a chapter to my uncle Sonny and his operation of the Cheekpoint pilot boat. 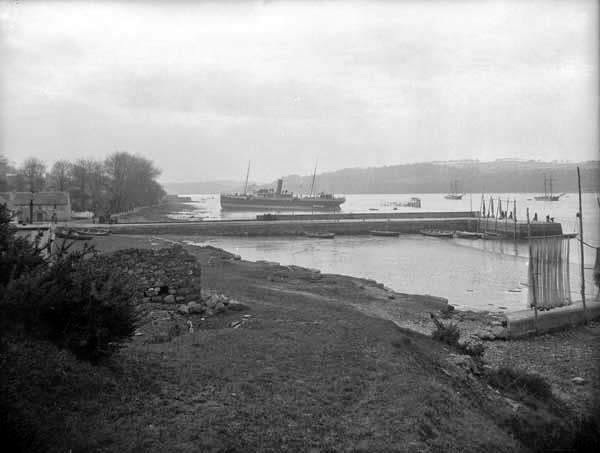 His role was to embark and disembark pilots coming to and from New Ross. The role of pilot or river guide is probably as old as people have sailed into foreign waters. Its a topic I remember well stories of competing crews of hobblers rowing down the harbour attempting to engage a ship with a pilot and a crew to tie up their vessel. A fascinating story in itself, but for another day. “…to lose no time in boarding such vessels as may be ordered…and to behave in strict propriety…hoisting your distinguishing colour (white, with his number in black) immediately on going aboard a vessel…” A rule I was never aware of and certainly not used in my days of viewing the pilots comings and goings. “You are to suffer no boat to take any vessel in your charge in tow, except you have orders…or except in cases of of sudden emergency or danger.” Presumably this was to avoid any claims of salvage and unnecessary expense. “You are in no case whatever to interfere with the duties of the Revenue Officers, but on the contrary are to afford them every assistance…any pilot found so engaged in … shipping contraband…will be immediately suspended…” we have seen before the issues of smuggling and what a serious challenge it was in the ports. To encourage “…zeal, activity and good conduct…” pilots are allowed to share in money for “…meritorious services…” however severe penalties are threatened for “…disobediance of oders, irregularity of conduct, or wilful neglect…” Drunkenness is considered the highest order of misconduct! Pilots are also expected to discourage any master who might “…cause any part of his ballast to be thrown into the river or harbour…” obviously causing any hazard to navigation, or lowering the available depth of water for shipping was a concern then as now. A sliding scale or rates for pilotage are given. These vary with a higher rate for foreign ships and the lowest for ships trading within the then UK waters. 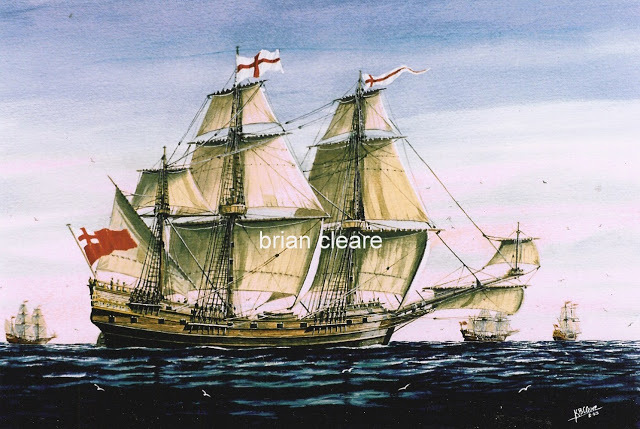 Ships between 30-40 tons are 10s for a foreign vessel, 8s for a British ship (this obviously included Irish owned and registered at the time) sailing from overseas and 5s for vessels trading within the UK. The highest charges went to ships listed at 400 tons and upwards. Charges range from £4 1s for a foreign vessel, £3 0s 9d for a British ship sailing from overseas and £2 0s 6d for vessels trading within the UK. In total 261 vessels paid for pilotage that year into the port, and the same number left it. All but 6 of these ships were British registered. The income this raised was £190 16s 4d each way. The total cost for the pilots that year £315 1s 7d. Disappointingly, there was no breakdown of the size of ships entering or leaving. Ships towed up or down must still pay pilotage, as a pilot is required at all times we are told. Nothing is made of the pilot boat operating at Cheekpoint, no name of the boat or person or persons employed. However in the costs of running to port, a small sum of £6 19s is expended for the pilot boats, buoys etc, which seems a small sum for the work involved in running a boat, except that the costs are made up elsewhere. In the photo from 1899 a square box pilot hut is partially seen, this was a base that pilots could await in “comfort” for a return trip back upstream. Not like today when cars are readily available. 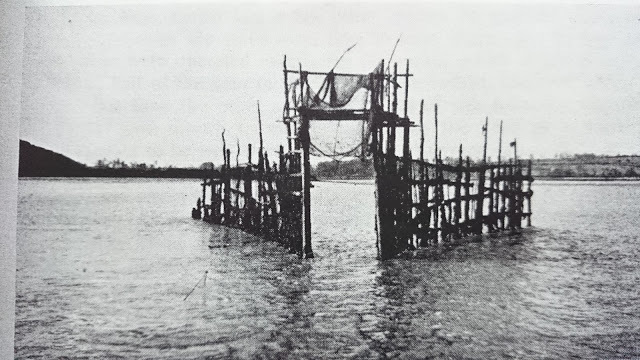 Of course the pilots had an altogether easier time of it than the later generations as the Barrow Bridge was yet to be built, and it would prove a challenge to pilots in time to come. In June we will take a look at the rules governing the Waterford Pilots, of which there is some curious and interesting information. If anyone can supply a local image of the 19thC pilots or related photos to complement this piece I would appreciate it. Much of the information contained is taken from Return of all Bye-Laws, Regulations, Orders or Ordinance, relating to Pilots or Pilotage now in force within the Jurisdiction of the Commissioners of the Port of New Ross; for the year ending 31st Dec 1854. Accessed from House of Commons Parliamentary Papers. I was reared on a story about the local weirs. As I heard it, one day the cot fishermen of Carrick and New Ross and areas in between descended en mass on Cheekpoint and proceeded to cut down the fishing weirs in the river. The cot men were bazzed out of it with stone by women and children but great damage was done to the weirs. One cot was overturned resulting in a man drowning. You might imagine that as a child I greeted the news with much indignation and fancied I would have thrown stones myself had I been there. In recent years I have heard others refer to it as the weir wars. But what exactly was the incident?, how did it come about? and what happened subsequently?. My present understanding* of the origins of the weir wars goes back to the coming of the Normans and the establishment of the Head weirs which I grew up with. I’ve described this before, but in layman’s terms**, the weirs were a large fishing structure, built in the rivers using timber poles, and employed the tides to catch fish. 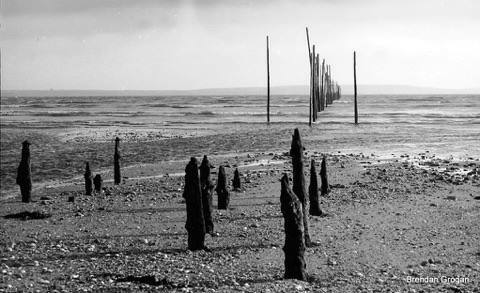 As the tide ran, the weir poles funneled the water into a narrow shute called the Head and from which a net was hung. Fish were swept into the net and retrieved by fishermen. This method of weir was employed exclusively up to the start of the nineteenth century. If you would like to know more about the head weirs, construction, fishing method and history I’m doing 3 workshops in the Irish National Heritage Park in Co Wexford over the summer. I’ve also written about the introduction of the Scotch Weirs and their fishing methods. Again, and in brief, these were also made with poles, and were used exclusively as I understand it to catch Salmon. 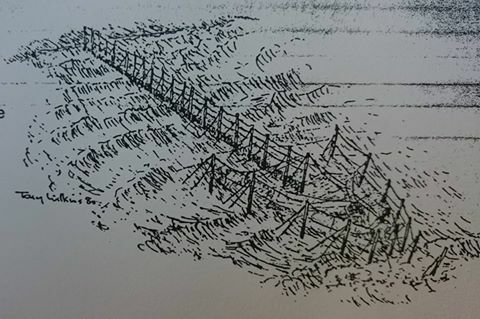 They generally ran from high water mark to beyond lower water, were placed perpendicular to the shore and worked effectively to block the passage of anything up or down the river. The scotch weirs were generally owned by landlords who leased out their operation to local fishermen. However the effectiveness of these weirs caused severe difficulties for local fishermen along the length of the Barrow, Nore and Suir. Indeed they were problematic where ever they were found. Newspapers carried many stories of traditional fishermen complaining of their livelihoods being destroyed. However, if the structures were owned and made money for the landlord class, then what could they do? The weirs must have been wrecked and rebuilt many times after. At a cursory glance through the newspapers numerous events, altercations, parliamentary hearings and court cases occurred in subsequent years. 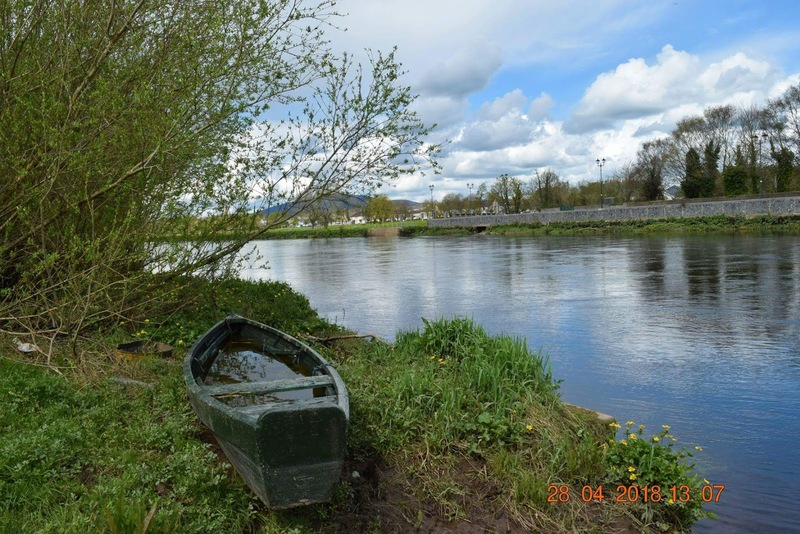 One poignant article from the height of the famine(5) relates how cots that were employed in removing weirs from the Barrow had been confiscated, leaving their owners with no means of earning an income. It was not until the 1860’s when new rules emerged to outlaw the majority of Scotch weirs. In most cases the Head Weirs were not affected. They were, of course, an altogether different operation. Something that is probably still not clearly understood today. *I say present understanding, as I am finding and considering new information at every turn in relation to the weirs…In fact its a topic that I believe deserves at least a masters research project if not a PhD. ** I am aware of a wide range of local descriptions and several terms from literature used to name weirs. In Waterford the two types of weir I am certain of as those I describe here. However the other words used about the harbour include; Sprat weir, Eel weir, Herring weir, Salmon weir, Ebb weir, Flood weir, Stake weir, Fish Traps, Fixed engines, Fish Garths.